The Rev. Dr. Geo. L. Brightharp is being recognized this coming week for having served one church, his home church, Mount Canaan Baptist for 35 years as pastor. This gave the opportunity to the Advertiser to sit down and hear from him what happened during this long time of service that he is most pleased about. Rev. Brightharp speaks of the Youth Center as being a culmination of many years of dreams and work. 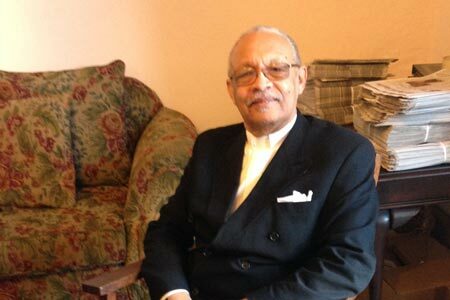 Motivating young people has been at the center of his work over the years, and the Youth Center opened the church, Mt Canaan Baptist, to serving young people in more active ways. It contains a gymnasium among other facilities. He quickly adds that motivating the young has never come before giving the message of Salvation to them. Brightharp gladly states the monetary value of the Center, 1.2 million dollars. He notes that they had a mortgage on it for 25 years and paid for it in 15 months. An achievement hard to match, one would think, noting leadership and cooperation in one church. Rev. Brightharp knows the exact date of his entry into service at Mr. Canaan, January 1 1979, and he says he is 2 weeks and one day into 36 years (that would have been on Jan.15, the date of this interview). He says the ”capstone” of his service, or the “greatest Ecclesiastical moment,” was having Dr. Charles Gilchrist Adams, Harvard educated minister whose roots are in McCormick, to come to a “place like this.” He came and preached a revival at Brightharp’s church. Rev. Brightharp is known by many as a guidance counselor of children, which he did for some years in the Edgefield County school system. This training carried over well into his pastoring and counseling his young membership. He proudly gives two ways that his church has served the youth: they had a tutorial program for 22 years that served over 1400 students. There are 5 practicing physicians out in the world who came from these students. (He remembers thirty children in the program once, 29 went off to college, the other one went into the US Navy and is now in the Mt. Canaan membership.) Futures Now In Education was another program that helped to develop teachers during a time when there was a lack of minority teachers. These projects brought up the name of Mrs. Willa Lanham, the church secretary, who played a large role in these ventures, and to whom Brightharp gives credit: “She’s a Captain,” in addressing her spirit and her capabilities. Mt. Canaan is known in the community of churches as the “mother church,” the first of some 40 that Alexander Bettis founded. The church is a leader in the Association which holds 24 churches in membership. Brightharp speaks of Alexander Bettis as “getting his due” now, after all these years following Bettis’s years of service. He notes that people come from far and near to study him, at the Bettis Academy museum. Another name he mentions is his father’s, Rev. George W. Brighharp. The word “family” spurs him on and he speaks of Mount Canaan as the “hub” of his family, and that it has been wonderful, challenging and sometimes difficult as he has had to “lay to rest” aunts, cousins and family members. As one knows it is not always easy to work in one’s home territory – noting that the “prophet is without honor in his home area,” paraphrasing an apt quote, and suggested by the Reverend. The services this week will give his congregation the opportunity to thank him and to enumerate the blessings that have come their way during his leadership. For those wishing to attend, the public is invited for January 25 at 10:00 a.m.